Should I Drain Swamp Pool? A journey with pictures. 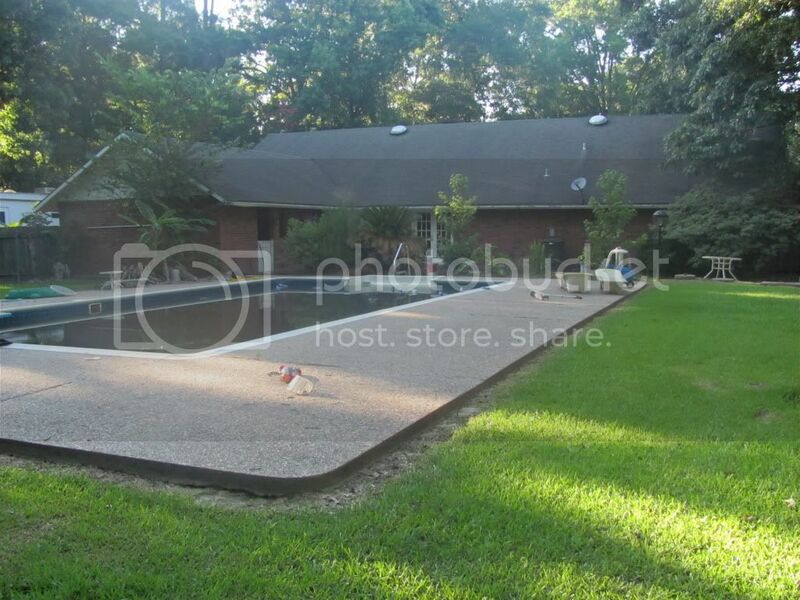 We're buying our first home and it has a pool. 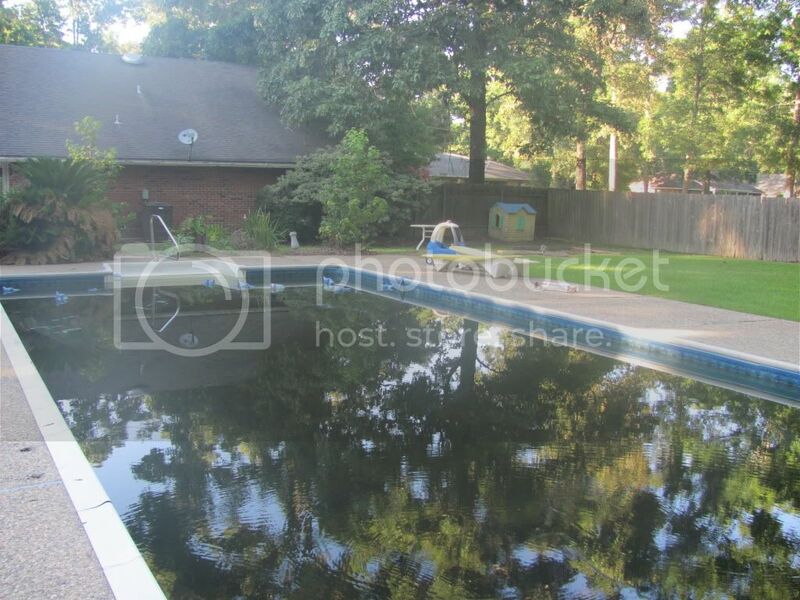 The pool hasn't been used in at least 6 months and the pool cover is floating in the water. The water is black and all you can see is the occasional toad on the surface. It's bound to have leaves and sticks and dead bodies at the bottom. My family says to drain the whole thing and start over, but others tell me this is dangerous. The pool is in ground with a vinyl liner. Any advice or alternatives is appreciated. Re: Should I Drain Swamp Pool? You don't want to drain it. It would be very difficult to get the liner smooth again. for information on clearing the water. Your first step should be to get your hands on a good quality test kit. The Taylor K-2006 or the TF-100 at TFTestkits.net will do what you need. It will be the the best investment you can make to save you time and money clearing the pool. I'm obviously new to this pool-ownership thing. What's the best way to go about getting solids out of the pool? Should I get the water clear(ish) and then fish out what I can see? Or should I try and scoop out the best I can, add chemicals based on test, and then scoop out the rest? If there are solids there, I would start by pulling out what you can see with a leaf net, then consider starting the filter (if it is functional) and get what you can out through filtration before dumping in chemicals. If you have a floor drain, I would shut that off for now, at least until you can see what is down there. Just use the skimmer to turn over the water and check the skimmer basket, pump basket and filter pressure very frequently. What kind of filter? Question for the experts....I understand draining the pool is a problem with a vinyl liner, but if it is really bad, would a partial drain and refill be a good idea? We haven't moved in yet, so all of this is planning. I'm not sure what kind of filter it has. How would I check that? Also, how do I know if it has a floor drain and how would I shut this off? The easiest way to figure out what you have is to post a picture of the equipment area. Better yet, a few pictures with different angles so we can get a view of where all the pipes go. Will do. 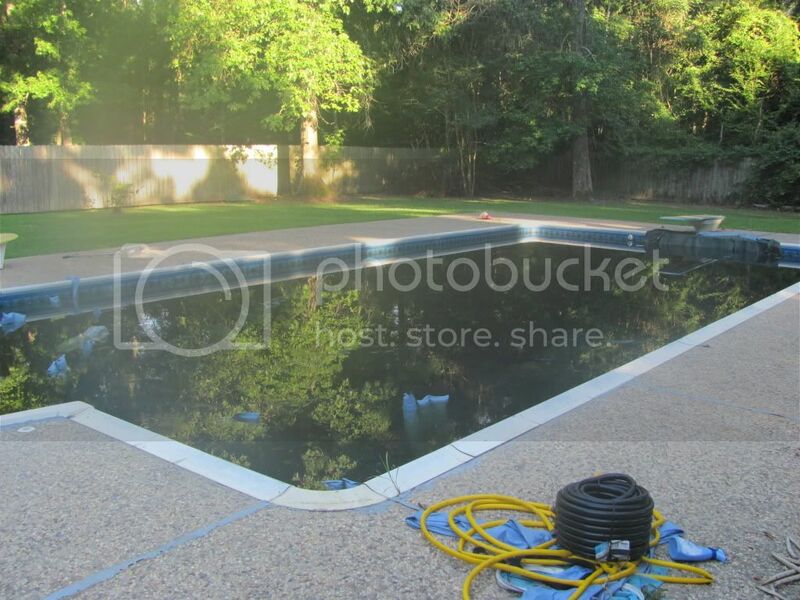 I have a couple of pictures of the pool. No close-ups of the pump. I'll post what I have and I'll make sure to take more as soon as we can get back to the house. Mine becomes a swamp every year and we recover every year. My hope for you is that you don't discover a bunch of hidden problems as you move ahead to enjoying your pool. Here are a few pictures to start with. I'll post more detailed pictures of the pool and pump and continue as we progress. Thanks to all for the help so far! Please don't drain the pool. It is definitely no no for vinyl pool. will shrink because there is no water pushing it against the wall any more. crack. Then you are looking for a new liner, which is very expensive. Go ahead and post some picture of your pump and filters. try to get the solid stuff out from the pool as much as you can. kit arrived. You can start the shock process to clear the pool. Look forward to your pump and filter picture. is a good reason to partial drain it, I would avoid it. Beautiful yard and soon to be beauiful pool. Thanks for the info on partial draining SSA. My wife and I were actually just discussing whether or not this was a good idea. Do any of the Taylor pool tests have the same contents as the TF-100? The Taylor brand seems to run cheaper. Plus it's sold on Amazon where I have a "prime" account and get cheaper shipping. Just curious. Thanks Geek Granny! We look forward to getting in the yard and getting some work done. ...Do any of the Taylor pool tests have the same contents as the TF-100? The Taylor brand seems to run cheaper. Plus it's sold on Amazon where I have a "prime" account and get cheaper shipping. Just curious. The Taylor K-2006 is also recommended, but it is more expensive in sense that is comes with a much smaller amount of reagents. I bought the K-2006 at the beginning of this season, and have already had to get replacement chemicals (from TFTestkits I might add). DO NOT GET THE K-2005. It is not the same. You want an FAS-DPD kit. Not exactly the same. See this link for more detail compare of the test kit. 8 oz vs 1.5 oz. I think considering the free shipping on amazon, TF100 is still a better deal. now. You are going to do a lot of FAS-DPD test during the shocking process. TF100 XL has double the reagent for that (and CYA). Like I said, we still haven't moved in and the previous owners are still in the process of moving out. I plan on changing a lot of the landscaping including adding a safety fence for the pool.